live in predominantly black neighborhoods. Segregation in communities can determine the quality of schools and medical facilities, access to public transportation, and residents’ positions in the labor market. 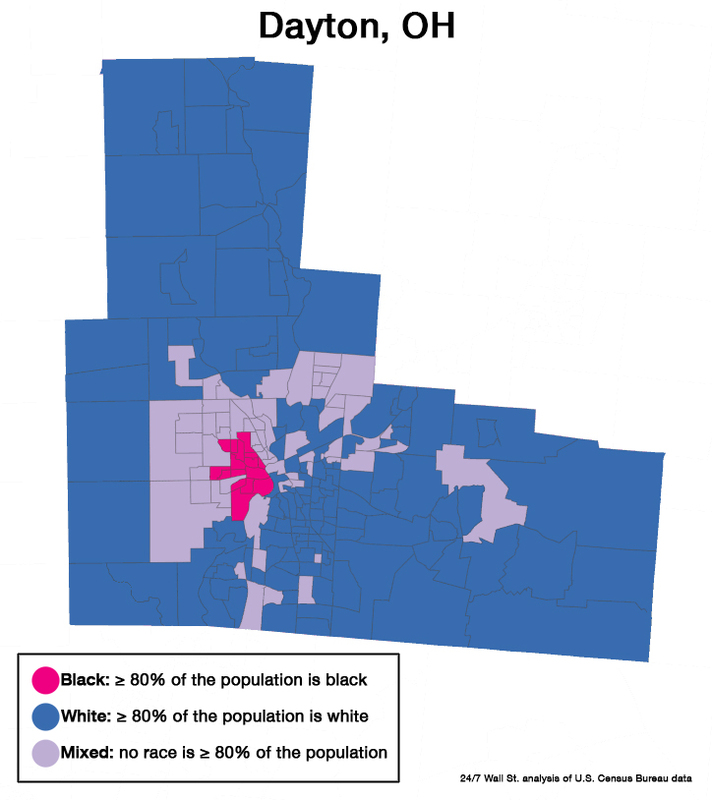 The segregation present in Dayton may explain the unequal outcomes that occur along racial lines in the metro area. Roughly 18% of the area’s black people are unemployed, compared to 6.8% of Dayton’s white residents. the vast majority of these neighborhoods located on the east side of the city. While segregation has led to a variety of poor outcomes in the D.C. area, the social disparities between white and black residents is not always as extreme as in many cities. Nearly 90% of the area’s African American adults have graduated high school compared to 92.9% of the area’s white residents. Similarly, 31.3% of black residents have a college degree compared to 35.3% of white residents. Nationwide, the college attainment rate is 21.0% for black adults and 34.9% for white adults. 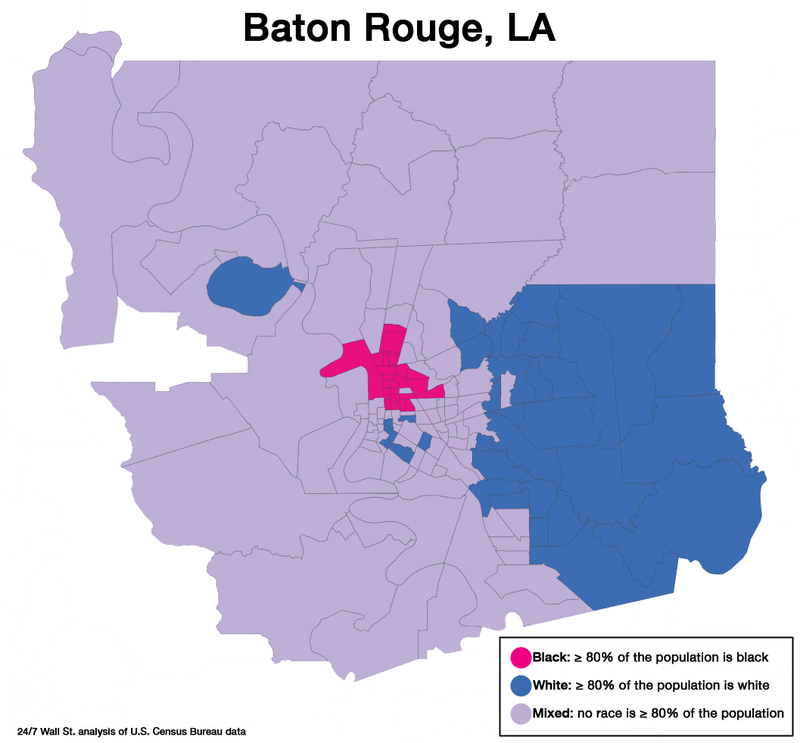 The Baton Rouge metropolitan area has one of the largest black populations. About 35% of the Louisiana capital’s 814,000 residents are African American, among the largest proportions nationwide. Of these 288,000 black residents, 30.6% live in neighborhoods that are predominately black. As is the case nationwide, black neighborhoods in Baton Rouge are far more likely to be low-income neighborhoods, usually in stark contrast with wealthier white neighborhoods. The poverty rate among black area residents, at 27.8%, dwarfs that of whites, at 11.3%. A recent development that points to the deep racial divide in Baton Rouge is a movement by a predominantly upper-middle class white neighborhood that sought to break off from the east Baton Rouge school district to start its own municipality. The petition nearly acquired enough signatures. The move would have left the remaining poor black schools with even fewer resources.